Senators have a longer duration of membership to give them greater independence and better opportunities for deliberation of proposed legislation. The initial intention was that the Senate would protect the interests of the less populous States by giving equal representation to all the states. Soon after federation Senators began voting along party lines rather than State lines, but the state-based system of representation has ensured that legislative decisions are not made only by the representatives of the more populous states. The Senate carefully scrutinises legislation and under Section 53 of the Constitution has almost equal power to the House of Representatives (they just can’t amend or introduce money bills). This means that the Senate is an important check on the power of the government of the day. At normal elections half of the senate places of the states are available and these Senators take their place on the following 1 July. The four territory Senate places are available for re-election every time an election is held for the House and these Senators places are only held for the duration of that Parliament. 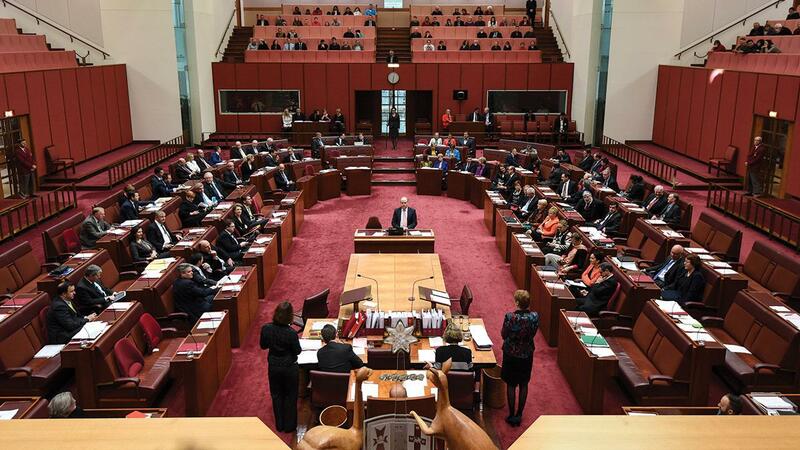 What happens when the Senate is cleaned out in a double dissolution? When the Parliament was dissolved on 9 May all 76 Senate seats became vacant due to the Prime Minister requesting that the Governor-General use Section 57 of the Constitution to dissolve the Senate and the House of Representatives simultaneously. As you can see the Senate decides how they should divide themselves. However, the initial draft of our Constitution in 1891 made provision for dividing the Australian senate into their terms “by lot” after the first election and then after any double dissolution. This is the method that was used to divide the Senate in the United States. To divide the Senators into their rotations after the election in the US in 1789 numbers were placed in a box, 1, 2 and 3. Each of the senators then plucked a number out of the box and their term was determined by the number. Anyone who had grabbed a 1 retired in two years, anyone who selected a 2 retired in four years and the lucky ones who had grabbed a 3 sat the full term of six years. There were extra provisions for a re-draw if two Senators from the same state ended up with the same number. US Senators were allocated length of term basically via a raffle. However, the US constitution has no equivalent to our Section 57 which allows a double dissolution to break a deadlock between the two houses of parliament which sees the Senate emptied. This mean the lucky dip type selection of length of term for the Senate has only had to occur once in America. In comparison, Australia has had to divide Senators into two classes seven times. Once after the first election in 1901 and then after each of the six double dissolution elections. Later this year the Senate will again split into two groups. The amendment I suggest need not occupy more than a moment or two in discussion. It is a blot on the face of a measure of this kind to require that the division of the senators into two classes after the first election shall be made by lot. I could understand that device being adopted in the absence of any other means of determining which senators should have the longer period. But the poll itself ought to afford, or be taken to afford, a reasonable indication of the wishes of the electors in this respect, and it is a probable injustice, as well as a mistake, to fall back on the antique method of settling questions of the kind. I move, therefore, the omission of the words ‘by lot,’ which will leave it absolutely at the discretion of the Senate itself to determine, after it meets, on what method the division shall take place. If the Drafting Committee think fit, they can adopt the method of providing that the three highest on the poll should have the six years' tenure. If that be the sense of the Convention, I will now simply submit my motion. This amendment was carried, leaving the Senate with the power to decide how the Senate is divided following a dissolution. As you can see the founders of our Constitution argued that the wishes of the electors should be used to divide the Senate into their two groups. So, how has the Senate been divided in the past? The traditional method used to divide the Senate is to decide who gets a long or short term based on the order of election. This has meant that the Senators who have been elected in places 1-6 have received long terms while those elected in places 7-12 have received short terms. It has been argued that this method for dividing the Senate was sufficient when we had a majority voting system in the Senate, but that this is not the best method for splitting the Senate now that we use a proportional system. To address this problem the Commonwealth Electoral Act was amended in 1984 to provide a new method for deciding long and short terms in the Senate after a double dissolution (section 282). This is known as the recount method. This method sees the vote counted to decide the 12 Senators elected and then recounted as if it was a normal half-Senate election. The six Senators in each state that show up again in the recount are given the six year term, and the six that only showed up in double dissolution count are given the short term. The reason was self-interest by Labor and Democrat Senators, who found themselves allocated more long-term positions at the expense of the Coalition. It meant that at the next election in 1990, the Coalition had more Senators than normal facing election while Labor and the Democrats had fewer seats to defend. So how the Senate is split after an election does have follow on effects at the next election. Section 282 of the Commonwealth Electoral Act is still on the books, but the Constitutional provision allowing the Senate to divide themselves trumps any legislation. We’ll have to wait and see how they divide themselves up after the election on 2 July.